In addition to the article itself, there is an editorial written by a prominent member of the urological community. These are intended to provoke comment and discussion and we invite you to use the comment tools at the bottom of each post to join the conversation. 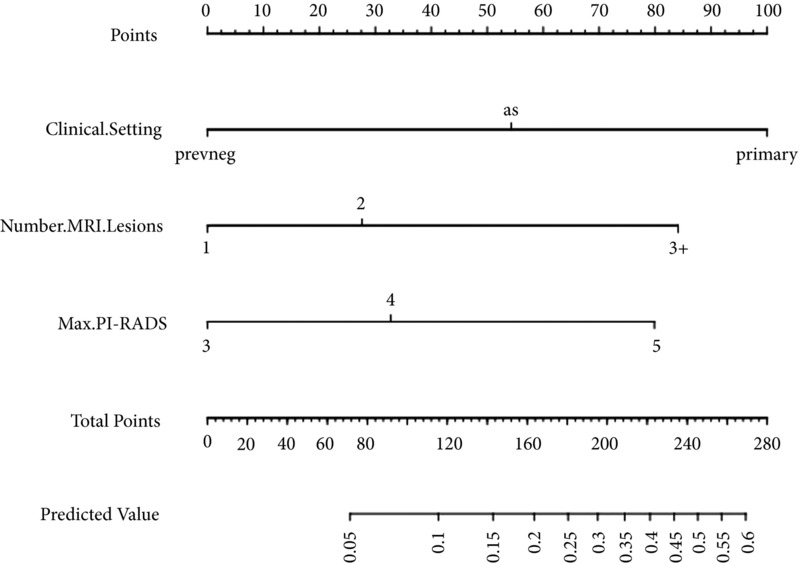 To develop a clinical prediction tool that characterises the risk of missing significant prostate cancer by omitting systematic biopsy in men undergoing transrectal ultrasonography/magnetic resonance imaging (TRUS/MRI)‐fusion‐guided biopsy. A consecutive sample of men undergoing TRUS/MRI‐fusion‐guided biopsy with the UroNav® system (Invivo International, Best, The Netherlands) who also underwent concurrent systematic biopsy was included. By comparing the grade of cancer diagnosed on targeted and systematic biopsy cores, we identified cases where clinically significant disease (Gleason score ≥3+4) was only found on systematic and not targeted cores. Multivariable logistic regression analyses were used to identify predictive factors for finding significant cancer on systematic cores only. We then used these data to develop a nomogram and evaluated its utility using decision curve analysis. Fig 1. Nomogram for predicting the diagnosis of clinically significant on systematic biopsy only and missed on targeted biopsy. Of the 398 men undergoing TRUS/MRI‐fusion‐guided biopsy in our study, there were 46 (11.6%) cases in which clinically significant cancer was missed on targeted biopsy and detected on systematic biopsy. The clinical setting, number of MRI lesions identified, and the highest Prostate Imaging‐Reporting and Data System (PI‐RADS) score of the lesions, were all found to be predictors of this. Our model had a good discriminative ability (concordance index = 0.70). The results from our decision curve analysis show that this model provides a higher net clinical benefit than either biopsying all men or omitting biopsy in all patients when the threshold probability is <30%. We found that omitting concurrent systematic biopsy in men undergoing TRUS/MRI‐fusion‐guided biopsy would miss significant disease in more than one in 10 patients. We propose a prediction model with good discriminative ability that can be used to improve patient selection for performing concurrent systematic biopsy in order to minimise the number of missed significant cancers. It is important that our model is validated in external cohorts before being employed in routine clinical practice.